Josephine (Joey) Hayes Matthews was born in Seneca Falls, N.Y. on Nov. 7, 1931 to Marjorie Fisher and Howard Hayes. She met her future husband, George (Matt) Matthews in Miami on vacation. They married and had 3 children, Melissa Evans, Marc Randolph and Darcy Jo. The Matthews family also “adopted” a friend of the family in 1976, Mark (Shorty) Hersh, who has been a loving son and brother. Joey worked many years as a bookkeeper but returned to school after gaining sobriety to earn her B.A. in social work. She then had a successful and fulfilling career at Mt. Sinai Hospital in Miami as a LCSW for addicts. She retired in 1996. Joey had many passions but helping people and animals is the main passion she kept returning to. She was instrumental in establishing several AA/NA meeting groups in Miami and Ft. Lauderdale. She was a sponsor to many new members and passed away with 44 years of sobriety. Joey was involved in The Seabird Sanctuary in Miami and loved birds of all feathers. She also volunteered at The Wildlife Center in Ft. Lauderdale for many years helping however needed. She was involved in La Plata County Humane Society and enjoyed spending time with the cats who were awaiting their forever homes. Joey was a longtime supporter of The Elephant Sanctuary in Tennessee, as she loved elephants! She also provided a loving home to numerous wayward furry and feathered friends along her path. Joey was a long time practitioner of Buddhism, taking her refuge vows with Thich Nhat Hanh. She was the eldest member of the Dharma Center where she spent many hours volunteering, learning, sharing and meditating. Joey loved sharing and it was always with wisdom, humor and warmth from her heart. 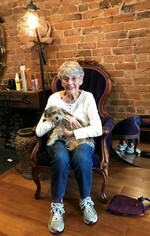 Joey was a voracious reader of all forms of Buddhist thought and sought to learn more about herself, relationships and the community surrounding her. Joey was in amazing health and enjoyed a life without general illness. As she grew older a series of TIA’s, a stroke and then a seizure resulting in a fractured pelvis ultimately wore her body down. She was surrounded by her daughter, Darcy and loving friends in her final moments. She transitioned in to the great beyond peacefully. Joey will be sorely missed by all who met and shared with her. Her light and wisdom will carry on within all that knew her. A Celebration of her Life will be held in February at the Durango Dharma Center, TBA. Those who wish to make a donation towards her cremation costs, can do so by check to Darcy Matthews. Mail to: Bank of Colorado 1199 Main Ave or deliver to any branch. If you wish to post remembrances, it would be appreciated.